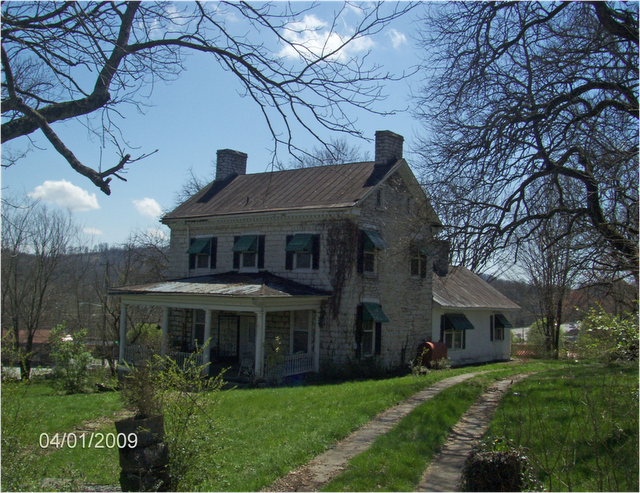 The Graham-Kivette House, built circa 1810, is the oldest home in Tazewell and one of only a few buildings that survived a disastrous fire in 1862. It was built by William Graham, a merchant and one of the founders of Tazewell. James Kivette acquired the home at the turn of the 20th century from William Yoakam, its then current owner. Kivette was a lawyer and coal mine operator. His daughter, Louise Kivette Redman, was a novelist and had several books published. Since the death of John Kivette, the last descendant of the Kivette family, the house has remained empty for a number of years, while the executors of the will figure out what to do with it. Due to a lack of maintenance, the masonry is in need of repointing, the foundation is sinking on the right side of the building, and wood is beginning to deteriorate due to rot. The porch roof and possibly the standing seam metal roof on the main portion of the house are in need of replacing. Portions of the interiors are beginning to deteriorate due to dampness, and paint and wallpaper are peeling from the walls. The Eastern Tennessee Preservation Alliance hopes that listing the house will help draw local awareness to the historic value of the house and the necessity of action before the house is lost due to neglect, deterioration, or fire. ETPA will work with the Claiborne County government, Claiborne Historical Society, and the East Tennessee Development District to determine the most effective strategy to protect this community resource. will the executors sell it? I have made an inquiry with the Claiborne County Historical and Genealogical Society about the house’s status and will let you know what I find out. “As the Historical society for our county we obviously would love to have the ability to protect that wonderful piece of our towns history but unfortunately we have not been able to get ahold of the house due to legal hold ups. http://www.edgetrekker.com/asset/265 – Check it out and let me know if I have your permission to keep it up. You certainly have my permission to use this information on your website. We share the same goals in encouraging the general public to explore and preserve America’s historic assets. Thank you. I’m a Kivett descendant and did not realize the house was in such danger until recently. I’m so glad the see the Historical Society and East TN Preservation Alliance trying to raise awareness it’s plight. Are there any preservation grants available to at least do some basic maintenance to keep the damage from getting worse? I just came across the history. I wish the family would approve a care taker and allow the home to be shown for a small few person to help with the up keep of the home. Such a shame to see it deteriorate.